We're back into the rhythm this week as early leaks from tomorrow's issue of Weekly Famitsu (dated 21st November 2013) have started to appear on 2ch and Sengoku Basara 4 is getting some coverage once again. It's moved to 13th place in the Most Wanted ranking (a drop from 11th place, and 8th place the week before). Motonari is still missing in action (and looking even more likely to be teamed up with the Xavists than ever unless Gyoubu and/or Hisahide will be involved with his story) but at least last week's mysterious lady has had her identity revealed. Here's what Weekly Famitsu has reported. The Kyougoku-Azai army joins the battle to seize the country! Nagamasa has been revived for the main game series! It seems that he'll be stirring up drama along with Oichi once again. In addition, the game's final new commander has arrived! Description: Introduced as an enemy commander, Kyougoku Maria is Azai Nagamasa's older sister. She's a woman who possesses so much beauty that it even distracts warriors from enemy armies. Maria considers herself the most valuable thing in the world; she views other people from this perspective and tries to determine whether or not they are good enough for her. On the battlefield, she attacks by manipulating cloth at will. "If you want to become my accessory...show me proof? That even you would make an worthy accessory for me..."
There's a picture showing Masamune wrapped up in Maria's weapon, then another with a kiss mark covering the screen. Caption: "In a defenceless state, bound by the cloth. A devilish kiss approaches Masamune!?" Then a strip of cloth is shown extending from her hand area and hitting Masamune. "Part of her outfit becomes a long cloth and knocks Masamune over! This long range attack looks like quite a threat... How do you close in!?" Another picture shows a purple-fringed cloth descending from above Maria with a caption: "A gigantic veil from the sky above!?" Description: The supreme commander who leads the Kyougoku-Azai army. Nagamasa is a deeply serious person who prizes justice and punishes those he has recognised as 'evil'. He's proud, too. Often trapped between the demands of his wife Oichi and his sister Maria, Nagamasa's problems never end. Although his reach is short on the battlefield, he fights by making use of his agility. "Where there is evil, there's justice as well... Where there is justice, evil is stifled!" There's a picture of him using Kizan: Juumonji and a caption. "One of his unique skills involves Nagamasa storing up the 'Power of Justice'. As the power builds up his reach increases, and he can also release a powerful technique." Description: The wife of Azai Nagamasa. Feared by many as the sister of Oda Nobunaga, Oichi harbours self-destructive thoughts. Since being with Nagamasa gives her a sense of peace, she's become deeply dependent on him and will stop at nothing to protect her husband. Oichi's weapons are her shadowy 'dark hands'. "Oh, I'm glad...you can die before hurting Nagamasa-sama...hehe." Caption: "The threat of the 'Great Dark Hands' from cancelling a normal attack!". There's also a small picture of Nagamasa holding Oichi by the shoulders as they're surrounded by the demonic hands. Lastly, there's a funny picture of Oichi and Maria tugging at Nagamasa earnestly while he makes an agonised face in the middle, captioned "Even Nagamasa is baffled, torn between his wife and his older sister!?". Here are the pictures I've found so far: one incredibly small picture which apparently came from Jump, and a camera phone shot of Nagamasa and Maria. G from the comments section also found this shot of Oichi. Here are alternate shots of the same pictures of Maria and the Azai couple. There's also some new information about the structure of the game's Sengoku Creation mode in the same magazine article. I'll just translate it all, even though it sounds erratic when they keep changing topics. In this game, you can alter history in countless ways depending on your character's actions and the shifts in the influence of the enemy forces. Depending on how you play you could reign for more than a thousand years. Choose your battle from the march screen! On the march screen, your character's drama unfolds first of all and then the enemy forces' movements are relayed. You choose where to march after receiving the information about your enemies; you can also view the rewards and requirements while making the decision. Since the enemy movements vary between plays, the details of each battle will also change. The five types of battle are normal, outbreak, omen, derivation and one-on-one fight. The outbreaks and omen battles can suddenly appear with shifts in enemy influence, so you have to look out for them. The pictures show Iinoya Castle as an 'omen' (purple), Sengenji as a 'derivation' (blue) and Honnouji as an 'outbreak' (red). The type of battle also affects the rewards and contents; these changes can be substantial. In the case of the 'one-on-one fight' battles you have to face an enemy boss right at the beginning of the stage. If you win the match, the prize will be a weapon. The anime cutscenes made by Production I.G. are shown if you clear one of the 'anime routes' in the game. Only some of the characters have this as an option. Alternatively, you can take the 'drama route' to enjoy a deeply dramatic story. The drama routes seem to appear as blue scrolls whereas the anime routes are coloured red. Drama breaks out during the march! There's a lovely picture of Masamune and Yukimura crossing their weapons in front of huge blue/red flags. Developments in the fights between enemy forces can change the conflicts which break out. You need to check which scenarios and battles have appeared! There's a shot of Mitsunari running and gasping "Hanbee-sama!" with his and Hanbee's portraits on either side of the screen. Rush into the drama routes! There are events with certain combinations of characters! If you head out to fight when a drama route appears, the mid-battle conversation will change. Each of the characters will have major story developments. Incidentally, finishing the drama route after branching will alter the ending. The outcome is up to you. At the end of Sengoku Creation mode, once you've unified the land, a timeline of the steps you took is displayed on-screen. It also shows the length of your reign. Finally, a few of the screenshots reveal even more interesting stage names, which add to the few I've posted about twice before. Please note that these pictures are incredibly small and I used my best efforts to make out the blurriest kanji. (With a blood-spattered background) An outbreak! Azuchi-Shiten gathering. (With a blood-spattered background) An outbreak! Revenge: the sword of the God of War. (With a blood-spattered background) An outbreak! Kaga: Maeda Kabuki-Matsuri. (With a blood-spattered background) An outbreak! Fate: the One-Eyed Dragon. The Chousokabe forces crush the Kyougoku-Azai forces at Pirate Fortress: Hyakki Fugaku. A fugitive ('otazunemono') lurks at Shizugatake. A fugitive ('otazunemono') lurks at Osaka. Both Nobunaga and Mitsuhide are shown as bosses on the Incident At Honnouji stage, and there's a new stage called Tango: Sengenji which belongs to Maria. In other news, remember the Sengoku Basara pickles from Kyomaf (Kyoto International Manga Anime Fair 2013)? 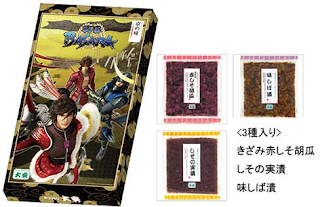 The special edition packs of Kyoto-style Daiyasu Sengoku Basara Kyou-tsukemono have now been given a wider launch, still priced at ¥683. The pack includes three varieties: red shiso cucumber, pickled shiso and purple shibazuke. You can even pick them up at import stores such as AmiAmi. I mentioned this on Twitter during the Animate Girls Festival 2013 at the weekend, but we now have a listing so it's official: Takara Tomy are to release a set of ¥200 capsule 'AR Gacha' collectibles on 28th February 2014. 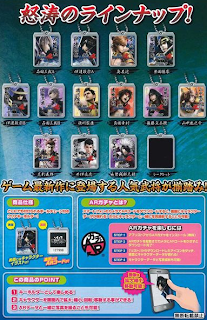 There will be fourteen different designs to collect - Masamune and Mitsunari have two each - and one of the characters is secret. I'm guessing it will be Motonari, especially since they've arranged them all with Motochika next to the blank spot. The news should continue in a few days as fans in Hokkaido are going to be shown a brand new Sengoku Basara 4 video this weekend at an in-store event, and more details about January's launch event should also be coming very soon. In the meantime, the team of PSandNintendFreak and Nine Demons Yoshitaka over at Koei Warriors subtitled the DLC costume video in English for the enjoyment of their fellow fans. 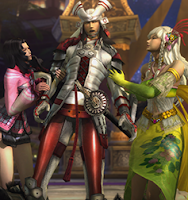 Update 07:55 07/11/2013: The official Sengoku Basara 4 website has now been updated so I've added pictures to my article. The front page has changed to show the game's cover artwork and there's a new (very short) teaser trailer. The Kyougoku-Azai army character profiles will be available on 14th November. I've moved the other news snippets to a dedicated news post today as there were too many. Yay! I really didn't think there would be info so soon. Looking forward to the Azai couple's new cg/story description and also more info on Maria. It's really surprising that it's her, well not extremely so after the speculation, but she does look more like she should be the dancer, Okuni. I wonder if her being Christian in real life means she is Xaviist here? Hey I don't know if you saw this but a photo of Oichi is on Twitter. Thanks (as usual) for translating all that info Raindrops. I'm, like many others must be too, of course very pleased to see that Oichi and Nagamasa are officially back. It looks like there will be *a lot* of drama potentional with the Azai and Oda now that there is a power-hungry (?) older sister and Katsuie involved too. I'm hoping he sides with Oichi and not with that brazen woman! Maria seems a little like Hisahide to me, in that I like her as a character but don't like her as a person. That's my first impression. From reading her profile I got the impression of a flirty, milder version of Motonari since it says that she considers herself the most important and sees others as accessories. Isn't it strange that the Azai couple look more like each other, than they look like their siblings? Katsuie looks like them too. :S Got a little worried (and confused) there when they added a Nagamasa outfit for Katsuie. But Nagamasa is playable too yay!